First of all, we are NOT against owning guns. We ARE against assault weapons, high capacity magazines, and the selling of guns without a waiting period or without any written documentation. We are also for raising the age to 21 to buy guns, keeping guns out of the hands of those deemed mentally ill enough to be overtly dangerous, and keeping / taking away guns from people convicted of spousal / child abuse, and felons convicted of crimes involving guns. Secondly, we had the only signs printed via letterpress in the whole march as far as we could tell. Maybe we need to start having a Lead Graffiti workshop right before these kinds of events. This is our fourth march in the past year, all with signs printed via letterpress. Our day started normally before turning scary. 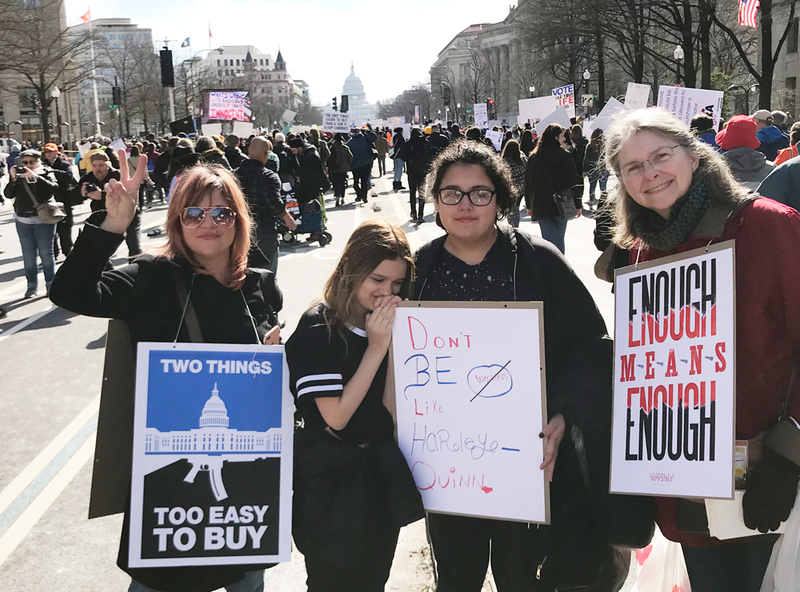 Jill and I attended the March for Our Lives with my daughter, Terre, her daughter and her friend. Driving down from Delaware, we caught the Metro in from Rockville, MD. We had decided to start our walk from 12th Street, which was listed as the beginning of the March down Pennsylvania Avenue. We arrived there around 10am, walking in from a side street. Marchers and signs were moving perpendicular to us and we drifted into the crowd and headed down Pennsylvania Avenue. Along the way, I was taking photos and had just taken one of the Capitol in the distance. One of the young marchers appeared with mirrored sunglasses (see photo at top), and I asked if I could take a photo of the Capitol reflected in the glasses. I took 3, and the people in her group asked if I would take a group picture of them. "Sure!" taking a bit more than than I had scheduled for. I said my thanks and turned around to catch up with my group, and THEY WERE GONE. It took 4 text messages and about 40 minutes to get me back in the group's space. Reminder to self to have a plan should something like that ever happen again. Need a couple of those tall, thin poles with a flag on top, or maybe just hook a dog leash to each other. I was walking through the crowd with my poster sitting on my shoulder which Jill finally saw. We were all feeling pretty panicky for several long moments and extremely relieved when we finally reconnected. Our final vantage point. The speakers are at that black bar which shows up right under the Capitol. Our group hit the marching wall right at Pennsylvania Avenue and 7th Street when the March turned into a singularity, and the space between people disappeared. We were in an excellent position near speakers with a straight on view of a giant screen and the Capitol Building in the distance. The talks were right in front of the Capitol. There was nothing to do but stand there. For hours. Finally breaking out of the March we headed back to the Metro. We spent the rest of the afternoon with a letterpress friend at his studio, followed by a tasty Mexican food lunch at 4:00. We were all pleased we had physically taken part in the March for Our Lives. There was a strangely patriotic feeling that even though we were only 2 people out of the estimated 800,000 who were there, we felt terrific that we were 2 people out of 800,000 who were there. The excuse that my vote doesn't count seems resolved in the positive. It counts because it counts. Sign from a high schooler from Florida who was packed into our area. We've long believed that gun violence was entirely out of control. This feels like we might have experienced the tipping point first hand. An additional item that has come to mind is the actual shootings, often by loners and people who feel like outcasts from the group. It might be worth considering that society has some responsibility in all of this, teachers, students & parents, looking for ways to help everyone fit in v. being pushed out. Every talk was riveting. Every speaker was young, from 17 or 18 down to 9. Imagine being 9 and talking to a crowd of 800,000 people. Everyone did it with grace, tears, yelling, and poetry. I think we might post one of our signs in the front yard for a couple of days. David Hogg's "No more!" and Emma González' loud silence were highlights. Emma spoke for 2 minutes and then paused in complete silence to demonstrate to the crowd how long the shooting at Marjory Stoneman Douglas High School lasted. Emma's silence was a gritty and thrilling reminder of our Lead Graffiti efforts to find ways through and around the rules to reach the truth of the unexpected. A wow day and we were there.